Following the confusion that his spoofing account has caused, the real prime minister Hatoyama finally appeared on Twitter[J] on the New Year’s Day of 2010. A happy new year to all citizens. I hope you keep in touch with us this year as well. 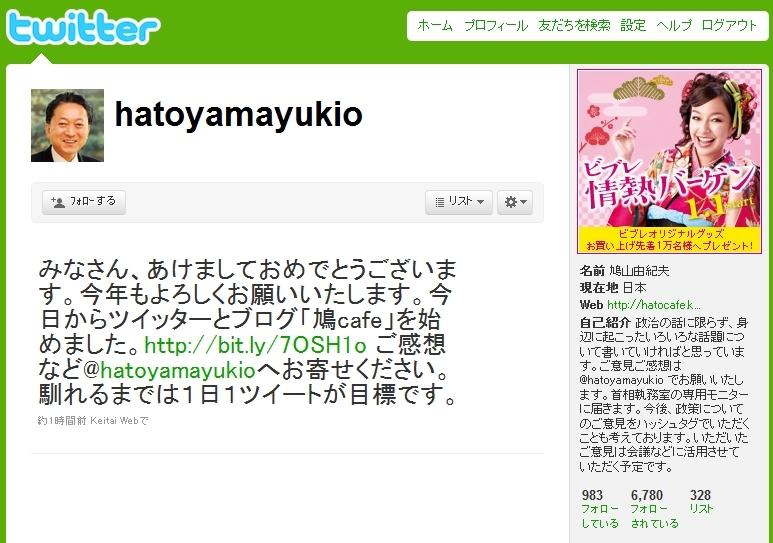 Today I just started Twitter and launched a blog titled Hatocafe[J]. Please drop me a tweet with @hatoyamayukio as a recipient if any comment. I try to post at least a message a day until I get used to do. As of noon on January 1st, 2010, he follows 983 users and is followed by 6,780 users. 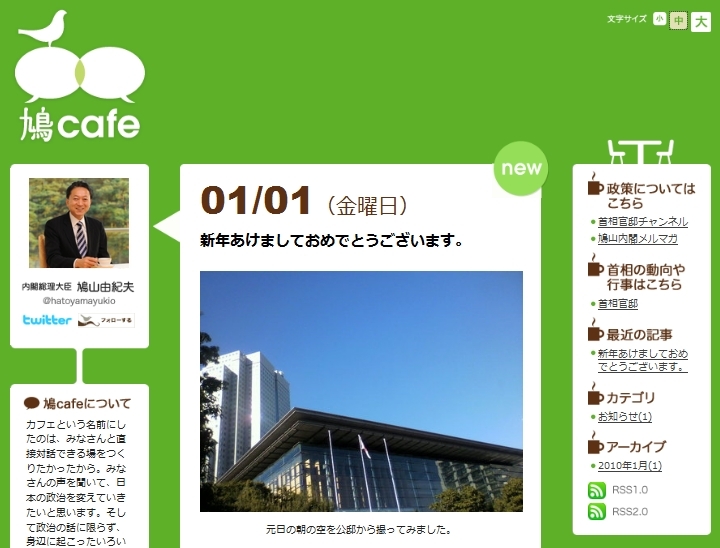 Hatocafe is his official blog and maintained by the cabinet office. Its first post shows you a snap shot of the blue sunny sky taken in front of the cabinet office building in this year’s first morning. Meanwhile, as Akky reported here on Asiajin, Hatoyama Administration is planning to set up a website called ハトミミ(hatomimi).com for collecting the citizen’s requests and opinions directly, but they learned that the domain name had been taken away by the third party, and the blogosphere points out such a ill-prepared arrangement. According to Japan’s National Information Security Center, governmental entities are ordered to use .go.jp domains for setting up their websites, for preventing users from possible phishing access to spoofing government-related websites. Now when we look at ハトミミ(hatomimi).com, it shows us anti-administration messages that someone has posted.